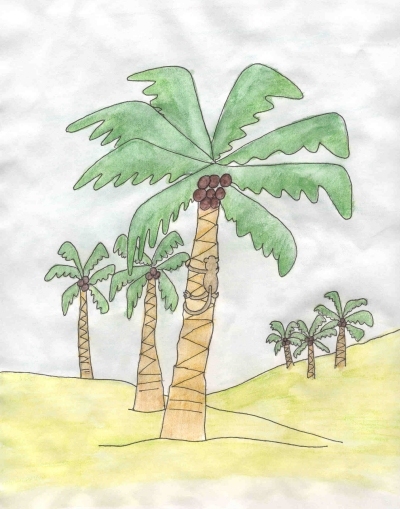 Bobo climbed to the top of the coconut palm, sat down and looked across the treetops. The sky was a beautiful shade of blue and filled with puffy white clouds that looked like cotton balls. He slowly peeled a banana. It was bright yellow and had little brown spots on its peel. "This is delicious," he said, taking a bite of the creamy-colored fruit inside. "I could sit up here all day. It’s magnificent." A breeze began to blow and the coconut palm began to sway gently back and forth. Bobo felt himself going from side to side. "This is fun! It’s like being on a swing. Wheee!" After a few minutes the breeze turned into a strong wind. Coconuts began to fall from the tree to the ground. "Whoa, what’s going on here?" Instead of swinging gently back and forth, the tree began to bend from side to side. Bobo grabbed hold of a coconut and held tightly, so he wouldn’t fall. Just then the coconut, and the monkey, fell to the ground. BOINK! BOINK! Bobo landed on his head. "Ouch!" More coconuts fell from the palm and hit him. "Ouch! Ouch! Ouch! Ouch!" He jumped up and ran away from the palm tree. He rubbed the top of his head. He had six big lumps on top of it. He could feel them through the fur. He watched the palm swaying back and forth. He saw how the leaves swung about. "That might be fun to swing on those palm fronds," Bobo said. He ran over to the tree and climbed up to the top. Using his agile fingers, he grabbed hold of the leaves. "Wheeee!" He swung to and fro as the tree bent from side to side. "This is great fun!" he laughed. The wind was blowing hard and whipped him all around the tree. He was swinging high in the air when the palm frond broke off. Bobo fell to the ground. BOINK! BOINK! He landed right on his head. "Ouch!" Now he had another bump. He sat down on the ground and rubbed it softly. While he sat there, he watched the tree bending clear to the ground. The wind was blowing very hard. The tree bent one way and then blew the other way, touching the ground. "That might be fun to climb the tree and swing back and forth on the tree trunk. I’d have to hold on really tight so I don’t fall. Should I climb up? Yes, I think I shall," Bobo said. He climbed to the top of the palm, which wasn’t easy. "Here we go!" The tree bent to the ground and then to the other side, over and over again. "Wheee, this is so much fun," Bobo shouted as he swung around on the palm. The wind continued to blow even harder. The tree bent so far over that Bobo hit his head on the ground. BOINK! BOINK! It swung over to the other side and hit his head on the ground again. BOINK! BOINK! Bobo let go of the tree. "Ouch! That’s four more bumps I have on my head!" He rubbed the lumps and sat down on a rock. "That’s enough. I’m staying down here until the wind stops blowing. It’s much safer!" BOINK! A coconut fell from the palm and hit him right on top of the head. "Ouch," he whimpered. Bobo jumped up and ran into the jungle. He found a cave and stayed inside it for the rest of the day, until the storm ended, counting the lumps on his head.